I spent today in my studio working on digital art again, for so long that I had to get up and move around just to keep my eyeballs from bleeding. I love doing it, but I have to remember to take frequent breaks. I have been working on a new series of digital collages. The one below is the first of these. I’ll show more in upcoming posts. The leaf skeleton is a high resolution scan of a leaf that I bought at the craft store. After scanning it, I changed the color to all white. This collage also incorporates scans of a variety of handmade papers. I’m pleased with the way it turned out. Thank you, Jesika! Glad you like it. I just love this piece Winter Collage 1. 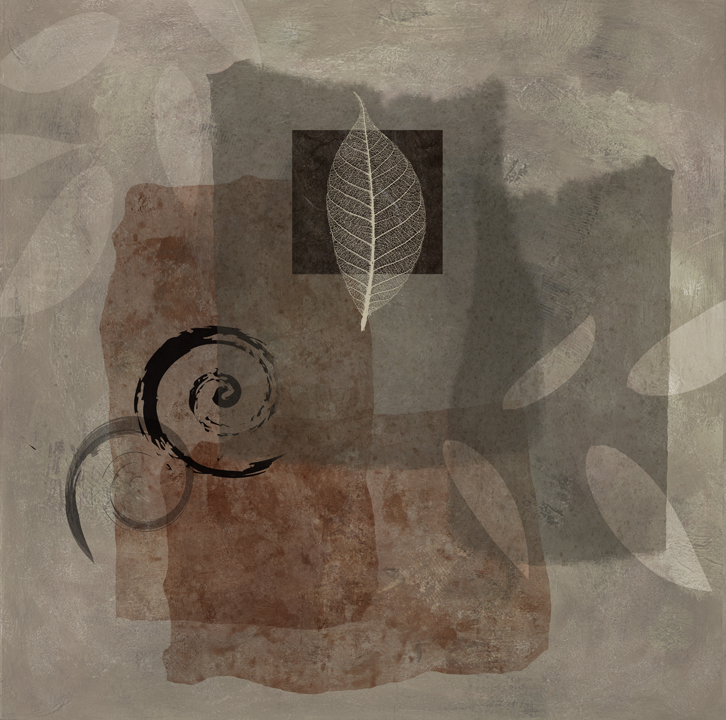 I have incorporated those leaves into my collages also, not scanned but the actual piece. I worry it might deteriorate, so next time I will scan it to make a copy. Thanks for sharing your wonderful art. So glad you like the piece, Pat. Doing digital collage is just one more way to be creative without getting glue on my fingers! That’s such a great idea for you to scan your leaves and print them out. Love it, Martha! So simple, quiet, beautiful. Lovely! Seems to be the consensus! Collage makes me happy, too. Thanks, Jennifer. So that settles it – we’re two happy artists! Love the echo of shapes and dimension achieved. Thank you so much, Elena. Enjoyed your art as well! Thanks for visiting.